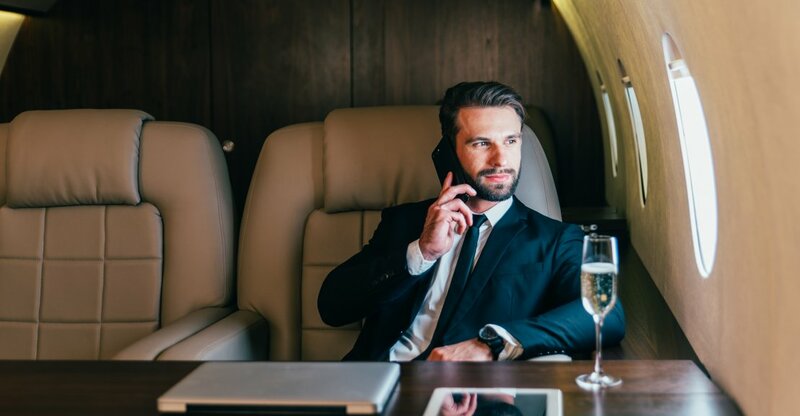 Covering great distances, for either business or leisure, is done more easily by air than land, and using a private jet is definitely more convenient than having to rely on scheduled flights. Obviously, buying a private jet is expensive. But if travel is a big part of your annual schedule then chartering a plane for every trip isn’t particularly cost effective either, often running into thousands of pounds per trip. Let’s look at some of the reasons why owning a private jet could be beneficial to you. If you own your own aircraft then you have the security of knowing that it’s available whenever you need it. It can be ready to fly at short notice and you have the freedom of being able to plan trips, with multiple stops, at your leisure. You have the ability to accommodate changes right up to the last minute without having to cancel and rebook or encounter extra charges for the privilege, which all apply if you are chartering. If you’re running late, a private jet will wait for you and, if your plans happen to alter mid-flight, it’s possible to change your flight plan while you’re in the air. Owning a private jet also means you can forget about repositioning flights (where a charter plane isn’t immediately available in the location you want and has to be flown in especially) which can be time-consuming and expensive to do. You’ll have a much greater choice of where you fly to. You should be able to fly directly to an airport close to your destination, without the need to change anywhere or have to spend lots of time travelling on after landing, which is likely to be the case if you are flying commercially. A jet also doesn’t need access to a major airport, so you will be able to access smaller airfields and hangars. There are over 5,000 airports that private planes can use in the United States and more than 120 across the UK. And you are able to bring all your belongings on board with you, rather than checking them in to the hold, whether that’s a large musical instrument, several pairs of skis or other bulky items. You can also have your pets alongside you in the cabin.. If you need to get to one (or several) important appointments and time is of an issue flying will always beat travelling by car. You can cover a far greater distance in a shorter space of time and don’t have to run the risk of getting stuck in traffic jams. And using a private jet will save you more time than using a commercial plane, which runs to the airline’s schedule, not yours. You don’t have to arrive at the terminal an hour or so before your flight is due to leave, you won’t experience any delays due to security checks, there’ll be no queuing to get on the plane itself and no waiting for many other people to get on and get settled. There’s also no hanging around in baggage claim when you get to the other end. And, in many cases, it may also be possible to arrange for a chauffeur to pick you up directly from the jet itself, saving yet more time than if you had to pass through the airport and meet them on the other side. If much of your travel is for business purposes then a jet offers much more privacy to conduct meetings on board. As you will only have passengers of your choice travelling with you, there’s no need to keep your voices lowered or to try and shield documents when discussing sensitive topics. If you own a private jet then you are at liberty to customise it in whatever way you would like, in order to ensure that it delivers exactly what you need in terms of comfort and practicality. You can add an entertainment system and a luxury bathroom, you can choose your preferred layout for a work environment (conference table, plug sockets, television screens etc.) and fit seats which adapt into beds in the cabin if you wish. You can also upgrade the avionics package in the cockpit to suit your needs. You will also be able to bring your own choice of food and drink on board. Possessing a private plane can be a great boon for the reasons we’ve already mentioned above, but have you considered how it could be of help to you financially, as well? Utilising it as a charter jet for others can help offset the cost of initial purchase and may even include tax benefits for you. This also means that your aircraft can be kept flying, even if you don’t have any need to use it for a while, which is much better for it mechanically than sitting idle for long periods of time. If you like the idea of your jet making you money but don’t fancy organising this yourself, you can employ a private aircraft management firm to handle the logistical and administrative side of this for you. While spiralling depreciation means that after around ten years a private jet has lost most of its value, if they are flown regularly and maintained properly then they can often be used for decades before they need to be taken out of service. This means that once purchased, your private jet could be with you for a very long time, without the need to spend millions more on regularly upgrading to a new one. If you have owned it from new then you will also have the reassurance of knowing that the correct maintenance schedule has been adhered to, as well as having complete documentation of how often and how far it has been flown. If this article has piqued your interest in owning a private jet, please take a look at the used aircraft we have for sale. If you have any other questions please get in contact.